This is an opportunity for a student or a small group of students to help design and build an outdoor learning area in Stoke Park Estate - in partnership with Stoke Park Action Group. The project will require you to respond to a brief and to develop concepts & designs for a learning environment at Stoke Park Estate which can be delivered on budget (the group has a budget of approximately £5,000 - £10,000 for materials & installation); they are seeking our support with the design of the space. UWE works closely with Stoke Park Action Group on a range of projects (it is immediately adjacent to the Frenchay Campus) and UWE has contributed some funding to support the development of Stoke Park Estate as a centre of excellence for outdoor learning - this project forms one part of that larger project. Students will work with - and be supported by - the Parkhive team and local resident & outdoor learning expert, Steve England, to design and build an outdoor learning environment which will be used by Stoke Park Action Group to provide exciting outdoor education opportunities for learners of all ages - including children, young people and FE & HE students. Suited for: This is a fantastic project for students with 3D/construction/design/architecture skills who would like some experience of working on a live project, a project with an environmental/nature focus and/or of working in & with communities in the city. 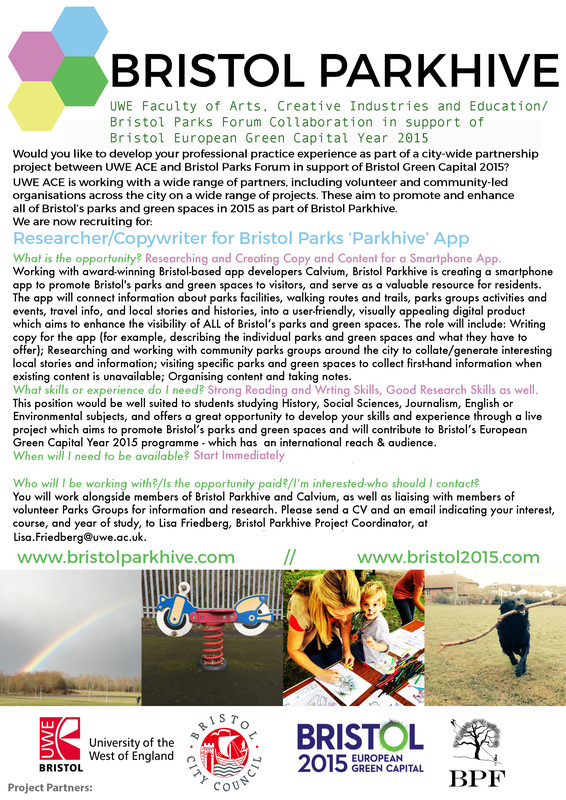 This is suitable for (a) student/s who would like to develop their experience, work collaboratively with a local community Parks group & use their skills enhance public space for the benefit of a wide range of people. You will have the scope to use your creativity and imagination to design, plan and deliver this project. For information, you can see more details of the work that Steve England (from SPAG) has previously led at Stoke Park Estate (and in other green spaces in the city) see: http://steveengland.co.uk. Additionally, you can find out more about Stoke Park Estate, including its considerable heritage value here.